I’m right there with you. I live in a condo and can’t own a grill. Fortunately, my workplace has one, and my co-workers really don’t complain when I put it to good use! William, I saw that post!! That’s so cool that you had a bbq at work. I love your Little Brown Egg! Thanks for the tag… I’m curious what my 23rd post was about. The galette looks tempting… I might have to get my act together and make one before plums and prunes completely disappear. Though I think I’m equally inclined to make a savory one with some soft chevre, caramelized onions, and maybe some tomatoes. There’s just something great about getting together with friends, throwing whatever you have on the grill and going for it. Jason, I’m right there with you… I usually prefer savory galettes over sweet, but this one was fantastic. I’m still trying to get the recipe. 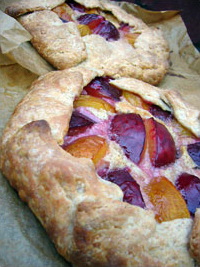 Hi Megan – that plum galette looks stupdendous! (i don’t get to use that word much…) – i remember the plums in seattle – someone would give me bags of them from their tree about this time of year…soooo good….